In honor of Abbot Lowell Cummings. 1923 - May, 2017. A beloved and inspiring architectural historian and teacher. When I heard of his death I opened his book, The Framed Houses of Massachusetts Bay. 1625 -1725, Harvard U. Press, Cambridge, 1979. I thought I was making a nostalgic visit. I had often used his book as a resource when I wrote the 'Sunday Drive' columns for the Eagle-Tribune newspaper, and later returned to consider what he had to say about English precedent and framing. I referred to it when I wrote to him about Asher Benjamin and he answered. 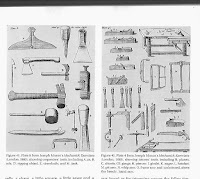 On page 45, were Figures 41 and 42: Plates 4 and 8 from Joseph Moxon's Mechanick Exercises, London, 1683 - not a book I knew. 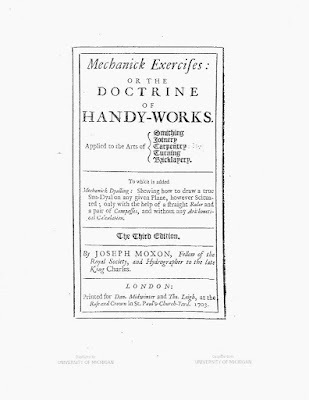 I wondered what Moxon meant by 'mechanical exercises'. Did he include compasses in his engravings of tools? I was happy to find that Mechanick Exercises is available on-line, digitized by the University of Michigan. Copied exactly, punctuation and capitals - except for the 's's that look like 'f's to modern readers. The whole book is written in this direct, practical voice. I read it with a smile. That Geometry, Astronomy, Perspective, Musick, Navigation, Architecture, &c. are excellent Sciences, all that know but their very Names will confess: Yet to what purpose would Geometry serve, were it not to contrive Rules for Handi-Works? 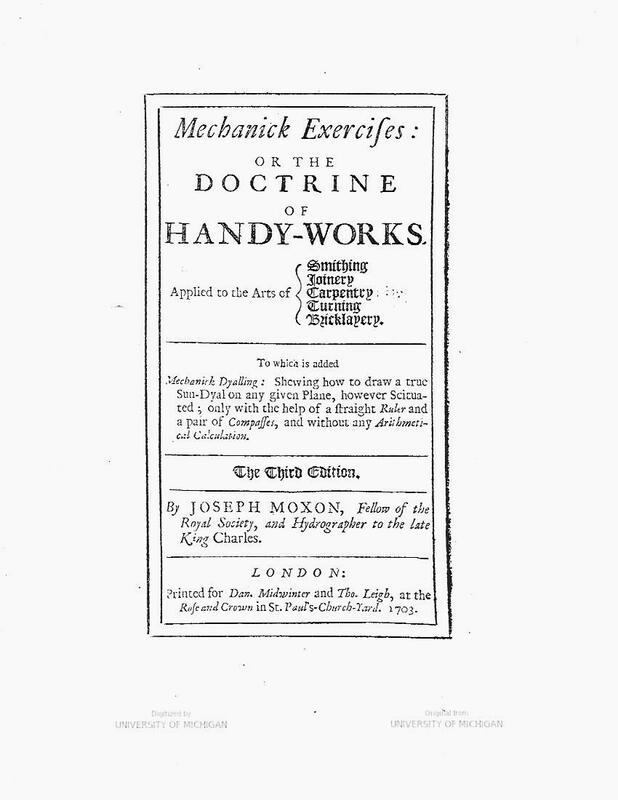 Moxon's book is for the Carpenters Trade. He says " Architecture is a Mathematical Science, and therefore different from my present Undertakings, which are (as by my Title) Mechanick Exercises: p. 117. 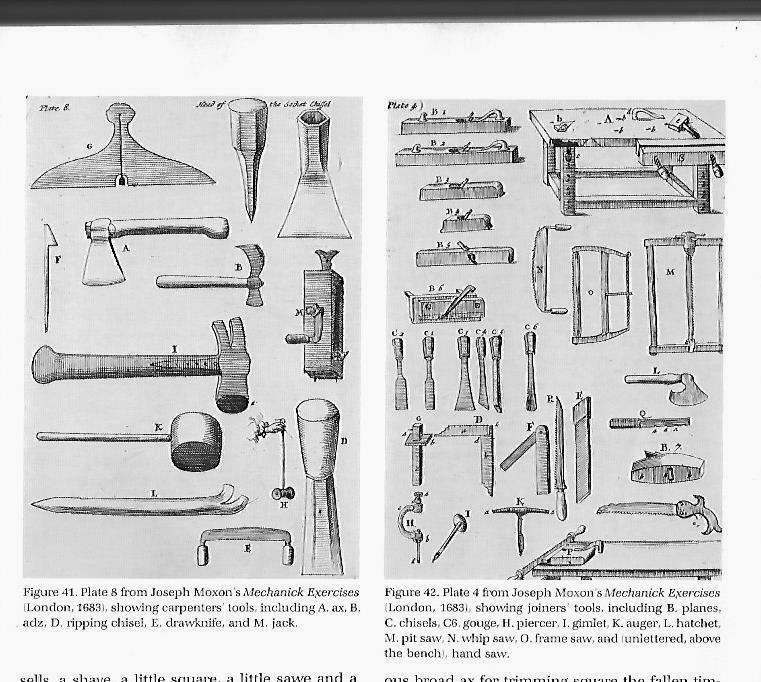 He describes all the tools illustrated in the plates. 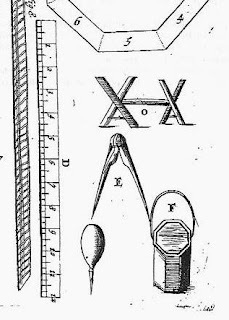 Moxon's description of Compasses, marked E : Their Office is to describe Circles, and set off Distances from their Rule, or any other Measure, to their Work. In other places he writes about using compasses in specific measuring situations requiring marking and scribing, holding stiff their Joint. He refers to Lines as did Serlio and Gibbs. I had hoped for more: practical geometric nomenclature and diagrams, much as Peter Nicholson drew and explained 100 years later. Moxon did however write wonderful descriptions and explanations. ...the manual use of it is, either to measure length with it, or to Try the straightness or flatness of their Work with. They Try their Work by applying one of its Edges to the flat of the wrought side of their Work, and bring their Eye as close as they can, to see if they can see light between the edge of the Rule and their Work. If they cannot, they conclude their Work is Try, and well wrought. I enjoyed the image of 'trying' with one's eye so close to the crack! And thought immediately of a modern Try Square. Grease in the glue is not good...we know he is right; and 'Clamminess' - a great word! - meaning 'soft and sticky' is in my unabridged dictionary. After 300 pages of Smithing, Joinery, Carpentry, Turning, and Bricklaying, the last 50 pages are devoted to thorough instructions for laying out sun dials - with annotated diagrams. Joseph Moxon (1627-1691) was an English printer who specialized in mathematical books and maps. He made globes and mathematical instruments. As well as this book I have quoted from he wrote a book about printing, the first written codification of knowledge which had been passed down orally. He was the first tradesman to become a Fellow of the Royal Society (look it up!). 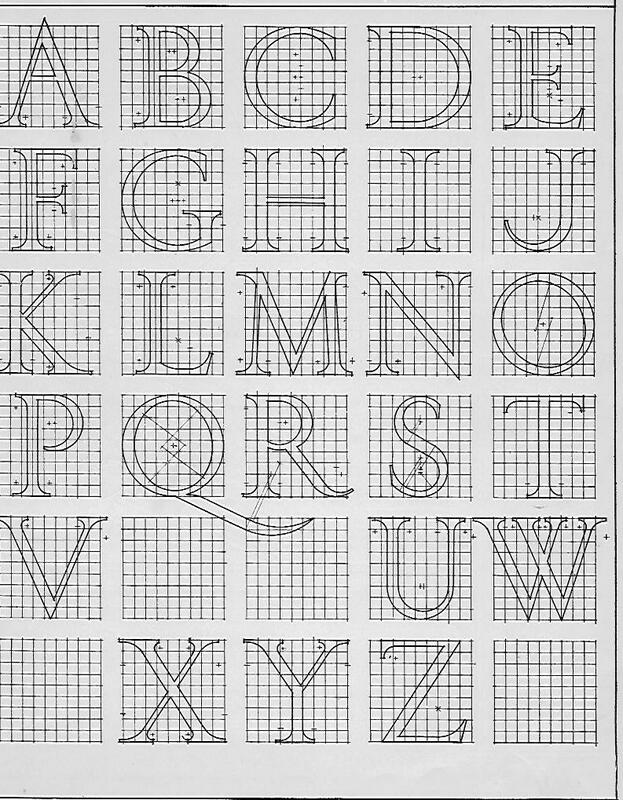 In the book on printing he described how to draw the letters of the alphabet using a straight edge and a compass. 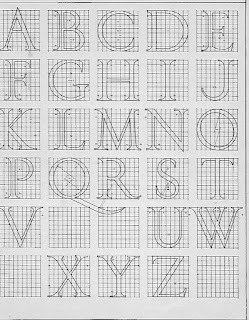 Page 257, Architectural Graphic Standards, 2nd edition, C G Ramsey and H R Sleeper, published by John Wiley & Sons , 1936. (250 years after Moxon,) shows the same thing. Note how radii are indicated for arcs - especially clear in the letters O and Q.
I am glad to have met Joseph Moxon. Thank you, Abbot Lowell Cummings.